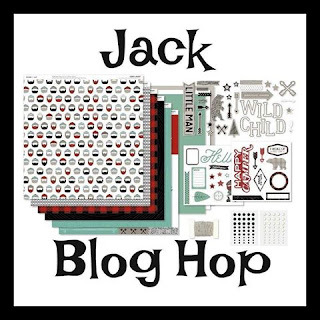 Welcome to our Jack Blog Hop! All the projects in this hop will showcase the Jack Paper Pack (x7222B Jack Paper Pack). A Blog Hop is a big 'circle' of projects that you see by 'hopping' from one person's blog to another. If you are coming from Gerri's Blog you are on the right track. Male cards are the obvious choice, however, I've seen some cute female cards done with this paper and don't forget treat bags! I made a 2,4,6,8 Bag (you can look it up online, or check back here tomorrow for instructions on how to put it together). My bag started with a 6x8 1/2" piece of the tree pattern paper. The finished size is 2" on all sides and 4" tall. Of course, I had to use the cute Bear Stamp Set and also the August Stamp of the Month! So Fun! For the sign, I used the 'chalk board' from the Stamp of the Month (School Year). I cut out a stamped image of the chalk board in Black Ink on Espresso Cardstock (dark side) and adhered a piece of black cardstock to the center and wrote on it with the Chalk Marker. The post was cut off of a second chalkboard that I stamped. The Bear is stamped in Espresso Ink on the light side of Espresso Cardstock, Ruby ink on White Daisy Cardstock for the mug and cut them all out with the Thin Cuts. I adhered the sign with adhesive, letting it hang over the side of the bag and adhered the bear to the front of the bag with 3-D Foam Dots (regular, not thin). I also put a small Foam Dot under the Coffee Cup and adhered the arms to the cup and side of the bear so it looks like his arms are out in front of him. I put a little treat (new Hershey's cookie treat bars) inside for my hubby. Then I punched two holes and tied some Juniper Twine (from the Whimsy Ribbon Pack). This is such a cute way to give a small treat! You can add this little goodie to a lunch bag/box and make someone's day! I am the last one on our blog hop today, if you joined us in the middle or just want to go around again you can start at Carol's Blog Here! Thank you for joining us today and I hope you are inspired and have lots of great projects to create! Supplies can be purchased from your Consultant (if you don't have a Consultant, I would love to earn your business! You can visit my shopping site Here! You can check out the catalog online there and send me an email for any questions I can help you with). How adorable is this?! I love it. You just gave me my Halloween project for this fall. Thank you! Very cool project! Love how each of us have things we love in the Seasonal Expressions. Great idea! Love the chalk board! Cute bag! Love how you did the chalkboard!